The U23 World Championships in Lahti, Finland got rolling on Jan. 21 with a classic sprint. In our quest to check in with some of the North American athletes in Finland, with emailed a list of quick-hit questions to touch base. Peter Holmes is twenty two years old and skied at the 2015 World Junior Ski Championships in Almaty, Kazakhstan. 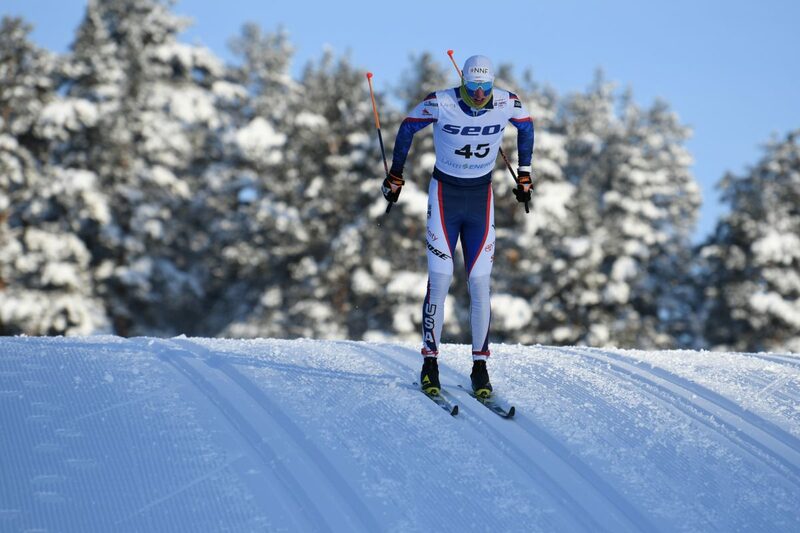 Holmes placed 27th in the classic sprint earlier this week in Lahti. On Wednesday, he placed 48th in the 15 k skate. Holmes hails from Tahoe City, California and skied at the University of New Hampshire. He now trains with the SVSEF Gold Team. 1) How did you pass the time on your flight to Europe? I tried to sleep as much as possible but was only partially successful. I watched Top Gun and read a little. 2) What are you reading? I’m reading the book Road to Valor right now. 3) How are you approaching this Worlds differently than those in the past? I’m definitely on better form this year than the last time I was here. Just trying to stay healthy and have a good time with fast racing. 4) What are some “performance goals” going into the races you are focusing on? One of my goals here is to reach the semi final of the classic sprint. And to ski hard and smart both distance days. If I do that I’ll be happy. 5) What are the races you are focusing on? All of them. The classic sprint is a race I have had good performances in the past. My skating has been on form so far this year so I’m excited to race the 15k skate. I also have not done a long distance classic race in a few years so it will be fun to race one of those again too. 6) Who best supports you when a race doesn’t go the way you envisioned? Whoever is around really. I don’t have one go to person but it’s just nice to tell someone a few thoughts of what went well and what could’ve gone better or to just let out some frustration. 7) Who is the first person you call/text/email…etc. when the race goes well? Generally my mom texts me before I get the chance to contact her. But I always respond to her first. She’s probably my biggest fan. 8) How do you best deal with external pressure to perform? The pressure is there but it doesn’t really affect me. I just keep it fun and have a good time and I know the results will follow. 9) What type of “fun” are you looking to have outside of skiing in Lahti? All sorts of fun! Great group of athletes and coaches to hang out with. Just excited for the good times to come.